By Bogna Haponiuk and Hanna Pamuła - PhD candidate. The law of cosines calculator can help you solve problems that include triangles. You will learn what is the law of cosines (sometimes it's called the cosine rule), the law of cosines formula and its applications. Scroll down to find out when and how to use the law of cosines and check out the proofs of this law. Thanks to this triangle calculator, you will be able to find the properties of any arbitrary triangle quickly. The law of cosines (also known as the cosine formula or cosine rule) describes the relationship between the lengths of the sides and the cosine of one of its angles. It can be applied to all triangles, not only the right triangles. 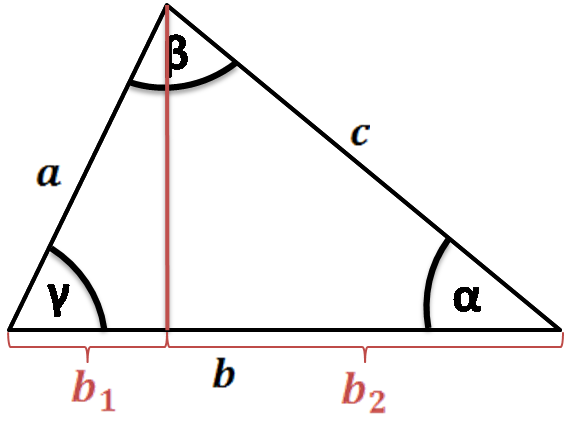 This law generalizes the Pythagorean theorem, as it allows to calculate the length of one of the sides, knowing the other sides and the angle between them. 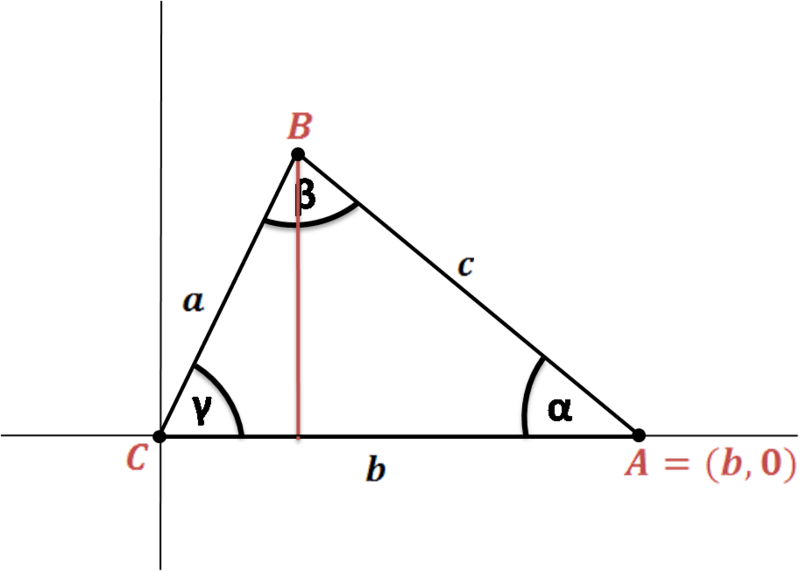 The law appeared in Euclid's Element, a mathematical treatise containing definitions, postulates, and geometry theorems. It wasn't formulated in the way we learn it now, as the concept of cosine was not developed yet. The first explicit equation of cosine rule was presented by Persian mathematician d'Al-Kashi in the 15th century, in the 16th century the law was popularized by famous French mathematician Viète, to receive the final shape in the 19th century. Just remember that knowing two sides and an adjacent angle can yield two distinct possible triangles (or one or zero positive solutions, depending on the given data). That's why we've decided to implement SAS and SSS in this tool, but not SSA. 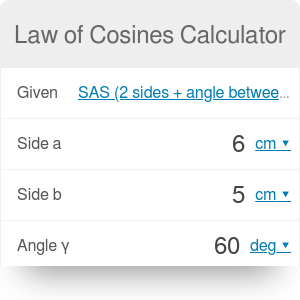 Also, you can combine the law of cosines calculator with the law of sines to solve other problems, for example finding the side of the triangle, given two of the angles and one side (AAS and ASA). Let C = (0,0), A = (b,0), as in the image. 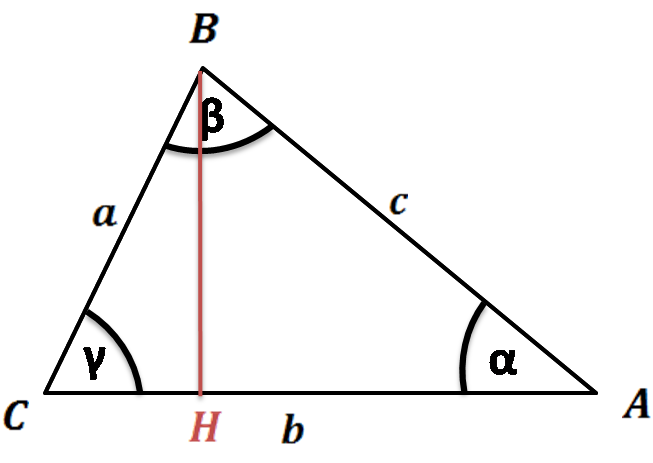 Assume we have the triangle ABC drawn in its circumcircle, as in the picture. The altitudes from point D and B split the base AC. CE equals FA. From cosine definition we can express CE as a * cos(γ), . 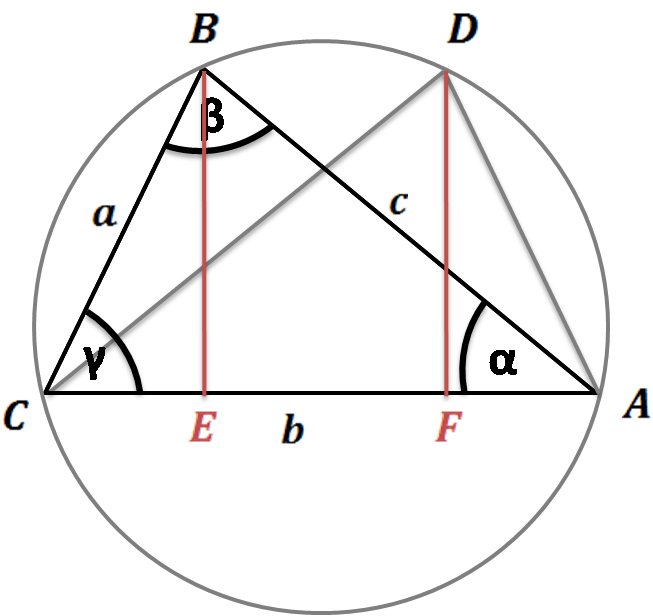 The great advantage of these three proofs is their universality - they work for acute, right and obtuse triangles. The last two proofs require the distinction between different triangle cases, the one based on the definition of dot product is shown in another article, and the proof using the law of sines is quite complicated, so we don't show them here. If you're curious about these law of cosines proofs, check out the Wikipedia explanation. Start with formulating your problem. For example, you may know two sides of the triangle and angle between them and look for the remaining side. Input the known values into the appropriate boxes of this triangle calculator. Remember to double-check with the figure above whether you denoted the sides and angles with correct symbols. Watch our law of cosines calculator performing all calculations for you! The second angle may be calculated from the second equation in an analogical way, and the third angle you can find knowing that sum of the angles in a triangle is equal to 180° (π/2). Choose the option depending on given values. We need to pick the second option - SSS (3 sides). Enter the known values. Type the sides: a = 4 in, b = 5 in and c = 6 in. The calculator displays the result! In our case the angles are equal to α = 41.41°, β = 55.77° and γ = 82.82°. After such explanation, we're sure that you understand what the law of cosine is and when to use it. Give this tool a try, solve some exercises and remember that practice makes permanent! Bogna Haponiuk and Hanna Pamuła - PhD candidate. Law of Cosines Calculator can be embedded on your website to enrich the content you wrote and make it easier for your visitors to understand your message.